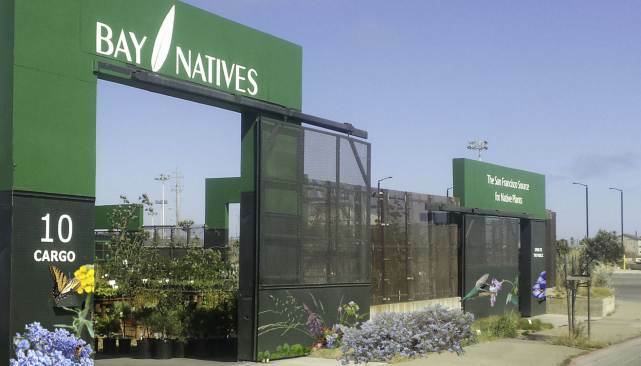 Bay Natives has offered California native plants for the urban landscape since 2005. We are a spacious garden center in San Francisco with easy parking near the end of Cesar Chavez, just minutes from the Mission District. We bring nature into your life. We do not ship (except some grass plugs), but can deliver locally for larger orders. Come on down and visit - for the best results, come see our amazing selection in person. In addition to native plants, we also carry fruit trees, permaculture/perennial veggie starts, herbs, berries and even a few houseplants and firewood. We also have many chickens, City Grazing's goats right next door, art, garden decor and handmade xylophones that make for a fun visit. We put on a seasonal pumpkin patch and also provide Christmas trees. Stay tuned for more.